1948: Japan is rebuilding her cities after the calamity of World War II, her people putting defeat behind them and looking to the future. The celebrated painter Masuji Ono fills his days attending to his garden, his two grown daughters and his grandson, and his evenings drinking with old associates in quiet lantern-lit bars. His should be a tranquil retirement. But as his memories continually return to the past - to a life and a career deeply touched by the rise of Japanese militarism - a dark shadow begins to grow over his serenity. 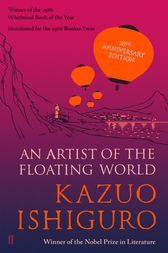 Kazuo Ishiguro's eight books have won him world-wide renown and many honours, including the Nobel Prize in Literature and the Booker Prize. His work has been translated into over forty languages. The Remains of the Dayand Never Let Me Go have each sold in excess of one million copies in Faber editions alone, and both were adapted into highly acclaimed films. His most recent novel, The Buried Giant, was published in 2015, debuting at number 1 on the Sunday Times bestseller list.